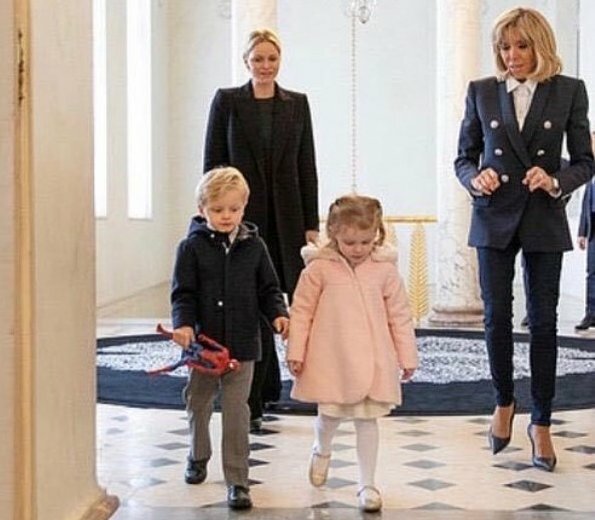 La première visite des jumeaux à l Élysée. Jacques ne me paraît pas intimidé. Il apprend déjà son métier. Gabriella mignonne à souhait,très observatrice. This two kids are adorable! And they know how to behave in every situation. Gabrielle is a little beauty. Indeed she does and Jacgues is like little Rainier. But the man in the third photo isn't President Macron. I'm sorry you see the world this way. There's nothing in the pictures to indicate anything other than Brigitte's hospitality. 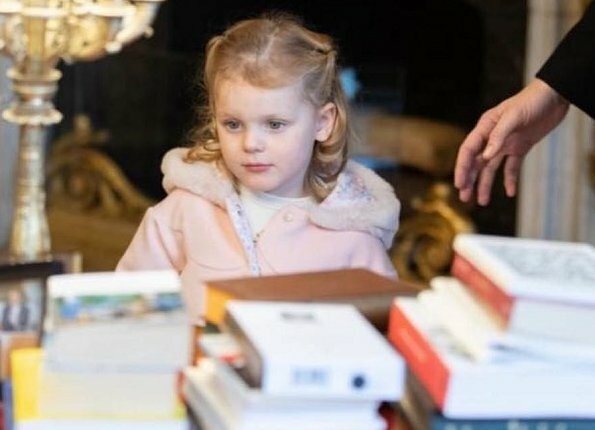 Super enfants CHARLÈNE PEUT ÊTRE FIÈRE. wat is charlene trots op haar kindjes ,ze zijn ook schattig!!! These children are absolutely gorgeous. What a beauty Gabriella is! And so well behaved, a testament to their parents. Well done. Adorable kids. I like the style they dressed them and the way this little twin behave. I have always disliked little boys being dressed like little men, that is so North American, which is odd, Charlene being Zimbabwean South African. Gabriella is a real beauty but personally I don't like her hair style, too old for a little girl. I totally disagree with the comment about Gabriella's hairstyle. She is beautiful and her tidy hairstyle enhances that. It may be old fashioned as in the styles of children in the 50s and 60s but it's not old. I do agree, generally, on the boys dressed in grown up clothing and prefer the old fashioned shorts and shirts favoured by Prince George.However, Jacques looks so gorgeous in this suit that who could argue. Lovely scene - mothers (teacher and swimming-teacher) and little ones. 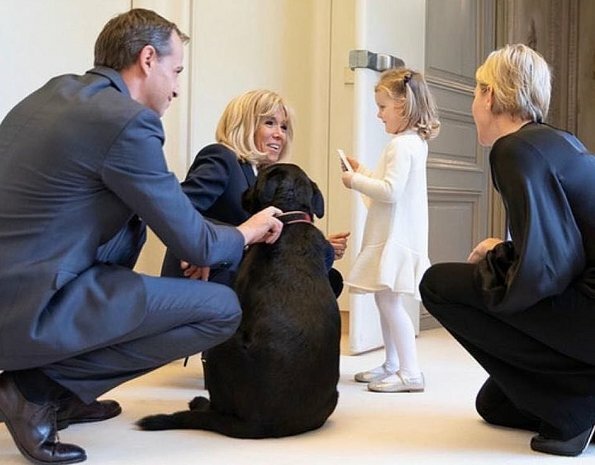 should we assume Charlene has (finally) learnt enough French to have a dialogue with Mme Macron? Or that Brigitte speaks English well enough? Gabriella looks so much like those classy Holywood kids in 1920-1930's movies. What gorgeous little kids and how well mannered the are. 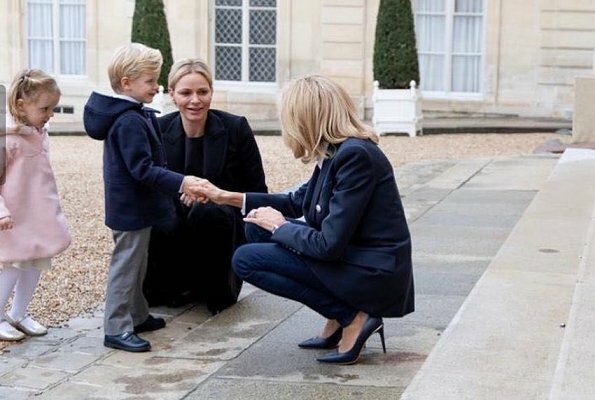 Manners and behaviour and.. would like to hear of happy kids..
Wow, little Prince brought his "Spiderman" to the Elysee!! 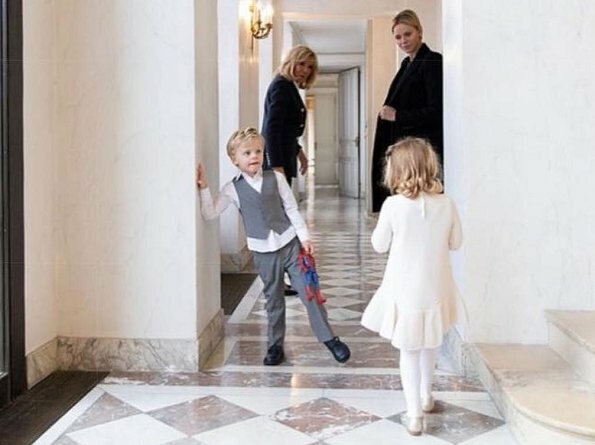 A quite normal looking Mum Princess Charlene like any other Mother her children. Lovely! I bet they had a good time. Mme. Macron should ditch her always existent shoulder patches on dresses, jackets, coats. It does not looking good on her petite frame. France is a Republic and neither France nor President of France can give noble titles and least authorize their use. All French titles remained cancelled and inexistents with constitution of 1848 and fourth republic foundation. In France doesn´t exist nobles neither aristocrats nor anything related with that. Not sure what that has to do with this. It has to do many with this. Think an you get target. I think I on´t nee to explain you or yes? I think the colour of Princess Charlene 's outfit is too much dark for an event like this. 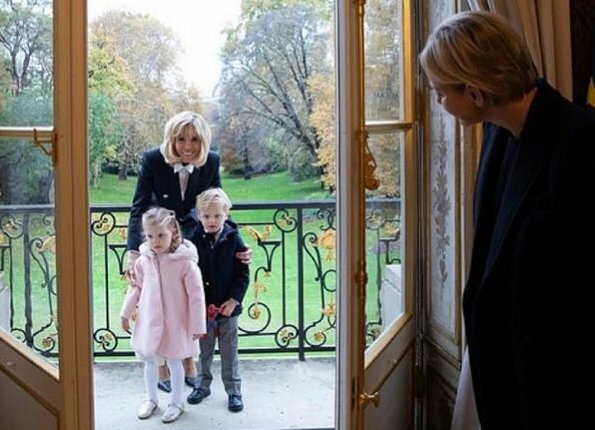 IMO, Mrs. Macron is just being a good hostess and keeping a watchful eye on her young guests on a slippery floor with raised thresholds. The children seem to be interested in the patterns in the marble/polished granite and like any other kids, ready to make a game out of it. Oh, yes; fashion. Mrs. Macron looks stylish in the cutaway blazer.